I am thus very close to one of the forms of anarchism, and I believe that the anarchist fight is a good one. What separates me, then, from the true anarchist? Apart from the religious problem, which we shall take up again at length, I think that the point of division is as follows. The true anarchist thinks that an anarchist society – with no state, no organization, no hierarchy, and no authorities – is possible, livable, and practicable. But I do not. In other words, I believe that the anarchist fight, the struggle for an anarchist society, is essential, but I also think that the realizing of such a society is impossible. Here is the text of Ellul’s Anarchy and Christianity from Google books. >Today Christ is born of the Virgin in Bethlehem. Today He who knows no beginning now begins to be, and the Word is made flesh. The powers of heaven greatly rejoice, and the earth with mankind makes glad. 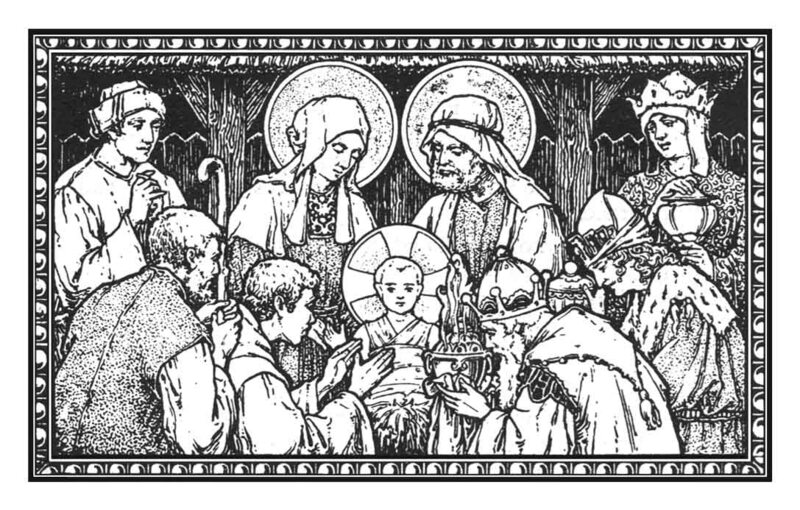 The Magi offer gifts, the shepherd proclaim the marvel, and we cry aloud without ceasing: Glory to God in the highest, and on earth peace, good will among men. 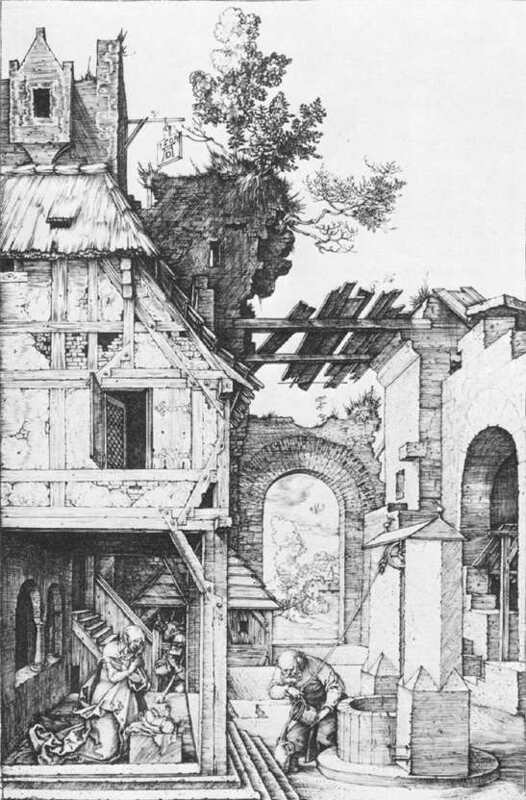 Moscow School, early 15th century. From Zvenigorod. Tretyakov Gallery, Moscow, 71 x 53 cm. The following description by Alexander Boguslawski of this painting is taken from here. This icon is interesting for several reasons. Some scholars attribute it to Andrei Rublev or one of his close followers. That immediately makes us pay attention to the excellence of the icon’s composition and to the depth of the message conveyed by the author. Moreover, while the figures and actions are depicted clearly (elements of monumentality) there is also complexity in the number of figures and diversity of actions. At the same time, this complexity is carefully controlled and does not detract from certain important, spiritual ideas represented in the icon. One of these ideas seems to be the miraculous power of God and the perfection — the completion — of His divine will on earth. 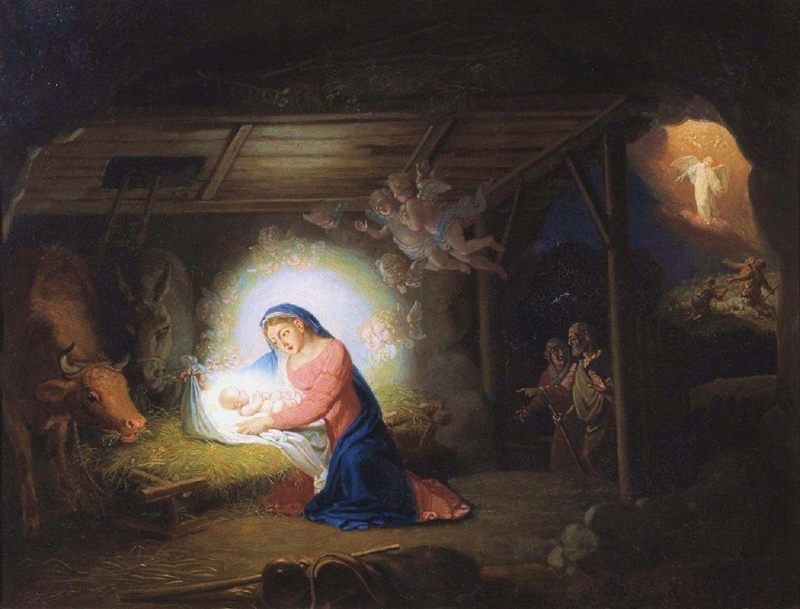 The painter succeeded in showing this “simplicity through complexity” by making each auxiliary scene reflect a reaction to, a consequence of or an event connected with the birth of Jesus. 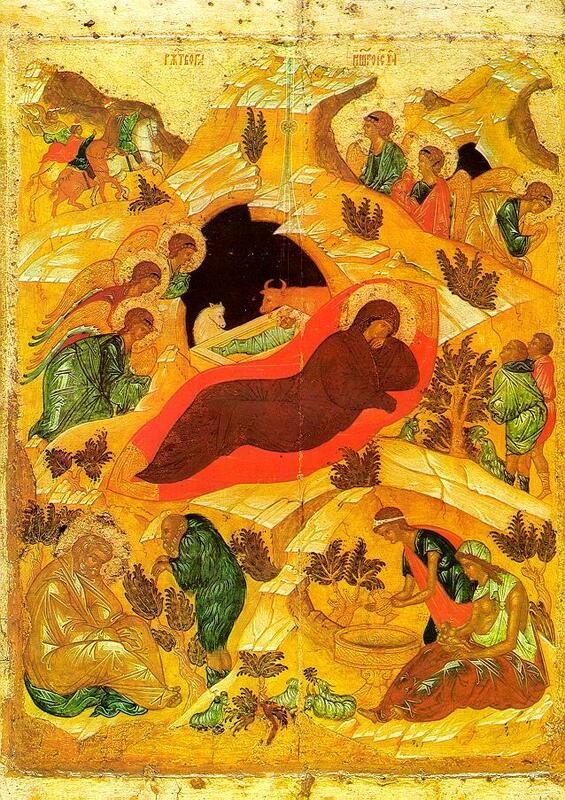 In this way his birth acts as a unifying force in this icon, as it has been for many believers around the world; these considerations add to the icon’s symbolic power. 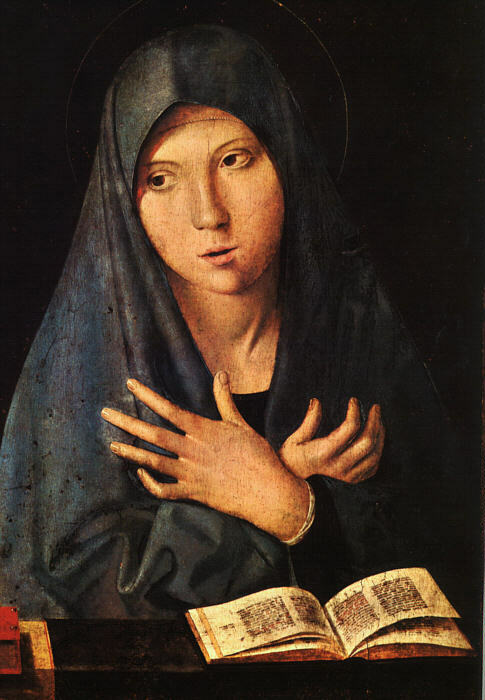 Another interesting facet of this icon is that although Mary is the largest figure, she does not seem to be its most important (though perhaps she is the most visually noticeable) feature. Though one’s eyes may be drawn to her immediately, the entire composition of the icon reveals that it is what Mary represents – the power, mercy, and fulfillment of God’s will – that is given the most emphasis, not the woman herself. The colors are warm and, by their complimentary nature, contribute to the unity of the whole. Touches of white are used to highlight both the cliffs and the clothing of almost all the figures – a notable exception would be that Mary’s clothes lack any such highlighting and, in consequence, appear very flat. Though this lack of highlights may be due to the state of preservation of the icon, observations of most, if not all, Russian Nativity scenes will reveal that Mary’s figure is usually depicted in an especially immaterial, “spiritual” way. Perhaps this was done to ensure that her presence, her very physical state of having just given birth, are both portrayed with fidelity to the spiritual reality of what has just occurred as opposed to the portrayals of the auxiliary figures, which are perhaps closer to physical reality. 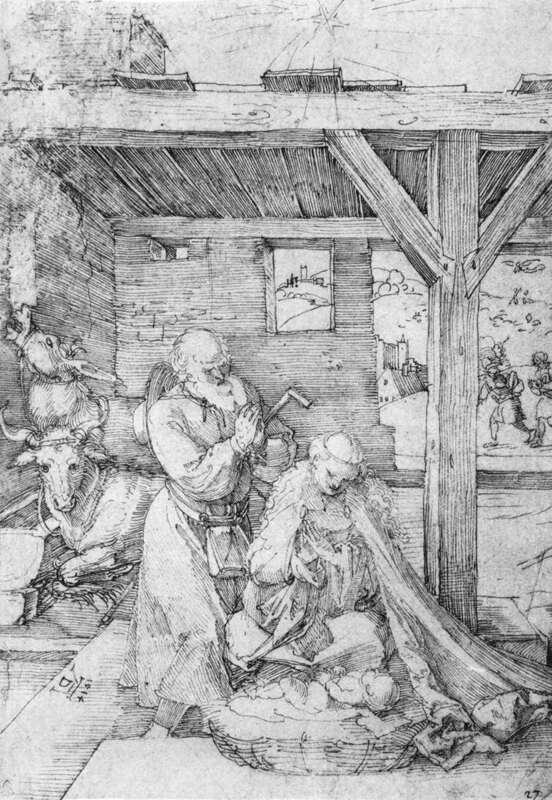 The stable or manger in Bethlehem The shepherds enter and kneel before the Virgin and Child. Hail, comely and clean, hail, young child. Hail Maker as I mean, born of maiden so mild! Thou hast banned I deem the devil so wild. The evil beguiler now goes beguiled. Lo, Merry He is! Lo, he laughts, my sweeting, A welcome greeting! Hail, sovereign Savior, for Thou hast us sought! Hail Nursling, leaf and flower, that all things hath wrought! Hail, full of favor, that made all of nought! Hail, I kneel and I cower-A bird have I brought. Without mar. Hail, little tiny mop, Of our creed thou art the crop; I would drink from thy cup, Little day-star. Hail darling dear, full of godhead! I pray The be near when that I have need. Hail! Sweet is Thy cheer! And my heart must bleed To see Thee sit here clothed so poor indeed, With no pennies. Hail! Thy hand put forth to us all—I bring thee but a ball; take and play with it withall, And go to the tennis. The father of heaven, God omnipotent, That set all aright, his son has He sent. 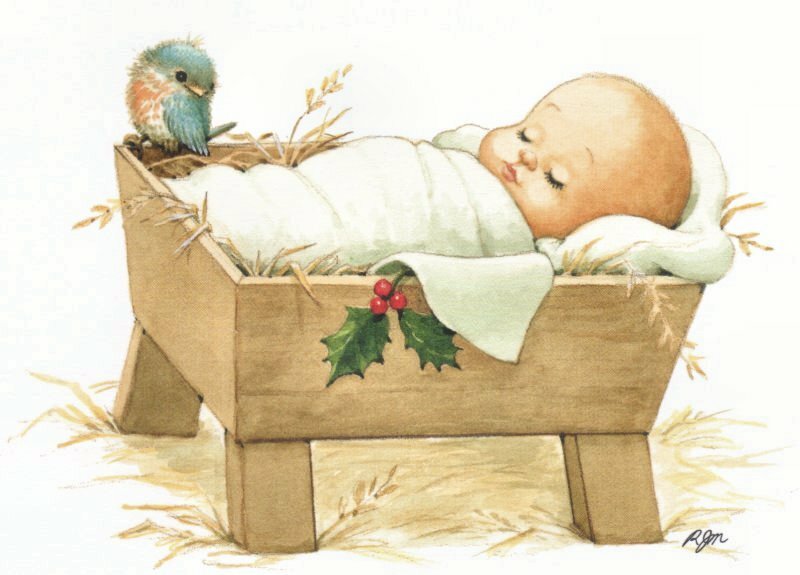 My name He chose forth, and on me his light spent; And I conceived Him forthwith through His might as God meant; And now is the Child born, May He keep you from woe! I shall pray him so. Till the glad news as ye go, And remember this morn. Farewell, Lady, so fair to behold. With thy child on thy knee. But he lies full cold Lord it is well with me! Now we go as ye behold. What grace we have found. Come forth! Now we are won! To sing of it we’re bound: Let us sing aloft! -Source:pp.123-127. Medieval and Tudor Drama, ed. John Gassner, Bantam 1963. Found online here. 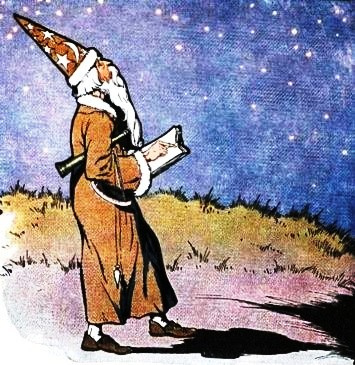 The astrologer went home somewhat embarrassed for having fallen into the hole, but not yet convinced by the villagers, for he knew what he had seen in the stars. The next day was a great earthquake. 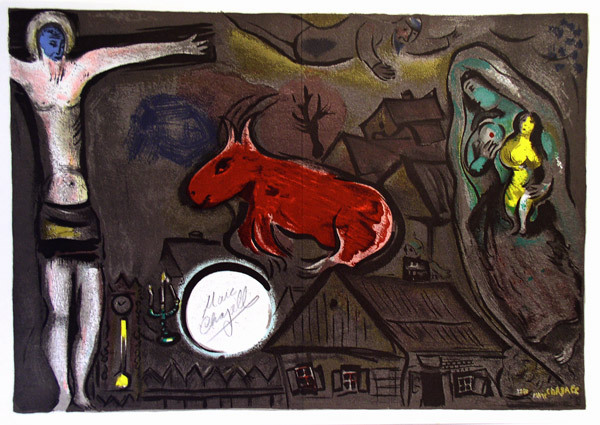 The villagers ran from their houses and looked to the sky in fear for the sun had turned black like sackcloth made of goat hair, the whole moon turned blood red, and the stars in the sky fell to earth, as figs drop from a fig tree when shaken by a strong wind. The heavens receded like a scroll being rolled up, and every mountain and island was removed from its place. Take care of the big things for the little things will be of no consequence. Christians are often known for believing in some pie-in-the-sky story that gives them both comfort and guilt. This vision is often derided as wishful thinking and used as one of many excuses for not believing in the gospel. Others, many of whom are Christians, emphasize the here-and-now aspect of the kingdom of God (the kingdom of God is within you) and propose that Christians spend more energy looking at the world before them, helping others, feeding the poor, etc. They would deride the pie-in-the-sky idea as merely a means to avoid the world of the here-and-now. The truth being, we are called to help the needy and poor, we are commanded to love our neighbors, but we are also longing for the kingdom still to come. Though the kingdom of God has come in one sense—with the coming of Christ and the outpouring of the spirit of God—we wait still for its final establishment and the corresponding removal of sin from our lives. Our problem, however, is not that we don’t pay more attention to what is right in front of us, and don’t let the future take care of itself. Our problem is that we are too easily rooted in the things of this world; too easily living in fear of what this world might do to us—holes in the ground and all. In the third chapter of the letter to the Colossians we read, “Set your mind on the things above, not on the things that are on earth.” This does not mean to disregard the needy and poor, in fact just the opposite. But it does mean that we should be captivated by what God is doing in history, concerned for the future, knowing this world will pass away, and longing for the kingdom come. But we are told differently; the world would have us say it is of the highest importance, its villagers telling us foolishness is to miss the world’s details in favor of the bigger picture. If we listen to the villagers we may never again fall into the hole, but we then might be destroyed when we most need salvation.